Many investors are faced with a fundamental problem: What should I do with my money? Hire an expensive investment advisor that invests in overpriced active management. 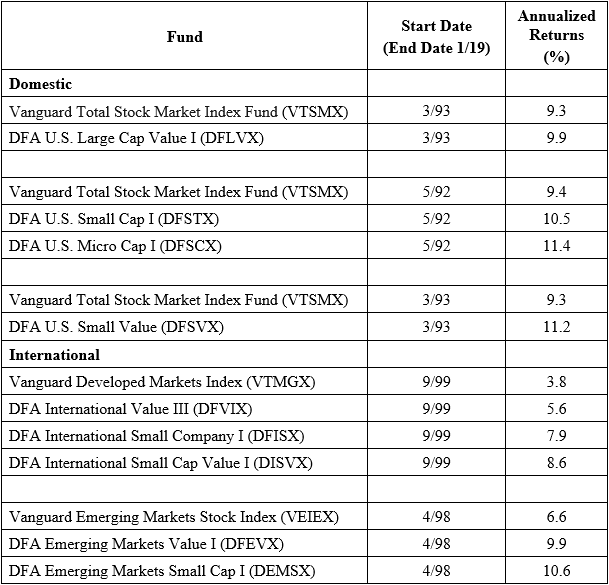 Hire an affordable advisor that invests in what amounts to a 60/40-ish portfolio. Hire a cheap robo-advisor that invests in what amounts to a 60/40-ish portfolio. Hire an affordable advisor in something different than the 60/40-ish portfolio. Option #1 is clearly a bad idea, but the options #2, #3, and #4 are all worth consideration. As far as option #2, there are plenty of affordable, honest, independent advisors who charge reasonable prices for the value they deliver. You’ll probably get a portfolio that essentially mirrors a 60/40-ish portfolio, but you’ll also have access to financial planning, behavioral coaching, and peace of mind (~50-125bps all-in). Option #3 is interesting as well, and there are plenty of dirt-cheap automated options that may not deliver the peace of mind a human advisor can deliver (at least not yet), but they also don’t charge that much for their 60/40-ish options. (~30-60bps all-in). Finally, option #4 is also reasonable if the differentiated investment approach is affordable and better at helping an investor achieve an investment goal relative to the 60/40-ish portfolio (~50-200bps all-in). A 60/40-ish Portfolio Isn’t Gonna Cut it For My Situation. What Should I do? Easiest solution: 60% global equity; 40% global bond (or your own special weights depending on individual circumstances). A reasonable approach. Totally DIYable. This is a personal question, but something one should always consider: Is this portfolio achieving your objectives? Meb Faber and Eric Richardson in their book, The Ivy Portfolio, hint at a do-it-yourself model that is a simple portfolio that allocates across US equity, developed equity, REITs, commodities, and US Treasury bonds. These 5 asset classes are commonly referred to as the “IVY 5,” since they form the basic building blocks for the endowments of the ivy league schools and others. This can be a reasonable allocation to achieve some investors goals. We’ll discuss this framework and why it is an interesting starting point for those trying to achieve an objective that may differ from those blindly allocating to a generic 60/40 portfolio. Different investors have different objectives, but if your goal is to capture global asset returns, but at the same time you’d like to minimize the chance of a complete meltdown, our fully transparent RAA Indexes may be an interesting approach to explore. There are three flavors of the RAA Index — balanced, moderate, and aggressive. Let’s get started on understanding the nuts and bolts of our RAA Indexes. Wealth is built by concentrated holdings, but wealth is protected by diversification. In short, if the goal is to get super rich, diversification and risk-management are arguably terrible ideas. A better idea is to concentrate on a single holding (i.e., build a business) and shoot for the stars. Of course, if your goal is to protect your wealth, diversification is a much more prudent approach. But there is no right answer. Goals are dependent on the investor and the specific objectives they want to achieve. Once goals are established, we need financial advice to identify an investment solution that will achieve our goal. Remarkably, financial advice does not need to be complex to be effective. Our belief is based on a robust view of the evidence and my Marine Corps brainwashing to focus on having “brilliance in the basics.” Complexity is often a smokescreen that hides a conflict of interest. For example, there are known incentives for financial firms to generate complexity in order to justify their existence. There are also well-established dangers associated with data-mining and whipping the data until it says what you want. Good financial advice should minimize both scenarios, if possible. Simple processes are less susceptible to data-mining. Simple processes are harder to disguise as black-box solutions that charge higher fees. Our beliefs serve as the cornerstone of how we build investment algorithms. We aim to keep things simple and effective. Asset Allocation: Instead of complex asset allocation, use simple allocation. Security Selection: Instead of story-based stock selection, use evidence-based stock selection. Risk Management: Instead of buy-and-hold, use a downside-protection system. Charts presented are for illustrative purposes only. Our downside protection models may not work in all situations and could fail to achieve their objectives. Each of these elements form the building blocks of the Robust Asset Allocation Index, which we discuss in the following three sections. #1 Asset Allocation: Instead of complex asset allocation, use simple allocation. — DeMiguel, Garlappi and Uppal. A few quotes attributed to Einstein sum up the key lessons learned from piles of disinterested research compiled on the subject of asset allocation. Complexity does not imply value. Complexity is Suspect. Is Equal-Weight the Answer? –David Swensen, Yale Endowment CIO. The point of the DeMiguel et al. research cited above is not to imply that equal-weight allocations are always optimal and/or sensible. For example, if a portfolio consists of two assets — 1) call options on 3x leveraged S&P 500 ETFs and 2) 90-day T-bills — an equal-weight allocation may not make sense because the assets involved have dramatically different risk profiles and the 50% allocation to the call options on 3x levered S&P will obviously dominate all the action in the portfolio. So perhaps 50/50 isn’t the answer, but neither is dynamic risk-parity with machine-learning Q-theory Black-Litterman Whiz-bang mousetrap optimization across these 2 assets. Maybe a static 20/80 allocation will fit the bill? The main point of their research is that the signals generated by whiz-bang asset allocation models typically reflect noise, not actual signal. And that brings us to the so-called benchmark for asset allocation, which is often considered the 60/40 portfolio, which is 60% allocated to global equities and 40% allocated to global bonds. (5) This portfolio reflects the essence of the advice gleaned from DeMiguel et al.’s work — keep it simple. That said, “experts” will put forth hundreds of arguments for why the 60/40 portfolio is sub-optimal, won’t work, and so forth, but the reality is that the portfolio does follow the FACTS and does provide some reasonable diversification. We can all argue why 60/40 is broken (I’m happy to provide those arguments), but for many investors this is an option worth considering. So how can we possibly improve upon the baseline 60/40 benchmark without going down the complexity railroad, which often is a bridge to nowhere? One approach is to look at the 60/40 portfolio as essentially 60% equity and 40% “diversifiers.” Bonds are often dumped in the diversifier bucket because they are relatively easy to understand. But bonds only represent one form of a diversifier — there are many others — but will bonds always be an effective diversifier? We’re not sure. Should we really put all our eggs in the bond diversification bucket? Possibly, but it seems prudent to at least consider a more robustly designed diversifier bucket. With a shift away from equal-weights across the 5 assets, we can augment the IVY 5 concept to create a 60/40 portfolio, where the key difference is the “diversifier” bucket is no longer entirely dependent on bonds, but has a mix of real assets and bonds. We refer to this portfolio as “RAA Simple.” The goal of RAA Simple is to capture expected returns associated with a diversified pool of global assets. RAA Simple achieves its goal of capturing global risk premiums, but without the chaos of any of the individual asset classes. So RAA Simple achieves the goal of capturing global risk premiums in a structurally diverse way. Did RAA Simple do better than a US 60/40? Not by a long shot. But RAA Simple and US 60/40 aren’t built to achieve the same goal. US 60/40 doesn’t achieve the goal of capturing global risk premiums in a structurally robust way. US 60/40 captures US risk premiums with limited asset diversification. If that is your goal, great. Another thing to point out is that RAA Simple doesn’t really curb your drawdown that much via diversification. -43.90% is a lot better than some of the alternatives, but the 2008 Financial Crisis taught investors that diversification isn’t a silver bullet to prevent permanent loss of capital. Moreover, US 60/40 is also not the sure-fire answer, as the table in our “world’s longest trend following backtest highlights.” We’ll talk about potential methods to solve the limits of diversification when we talk about risk management, but first let’s move on to security selection. Value: Buy cheap stuff everyone hates. Have a 10+yr horizon and stick with the strategies through thick and thin. Here are some key stats related associated with our Quantitative Value and Quantitative Momentum Indexes, relative to passive equity exposures. The key thing to consider with any simulated index is that they look good on paper — there was never a backtest published that didn’t look great. But what generated these excess returns? And why can we hypothesize that these excess returns will be captured in the future? This is a debate that still rages on in academic research circles, but essentially excess expected returns are driven by 2 potential sources: 1) additional risk, and/or 2) systematic mispricing. With value and momentum in particular, there is arguably some mispricing built into the premiums, but exploiting these premiums is not a free lunch. An investor will likely be asked to take on more risk, and one can expect to endure epic episodes of relative performance pain (See here on momentum and here on value). Bottomline: no pain, no gain is a good motto to live by when it comes to setting financial investment expectations for focused factor investments such as our flavor of systematic value and momentum. So let’s assume that the evidence is compelling enough for our quantitative value and quantitative momentum processes and you are a long-term buyer. Great. But how do these exposures work in the context of our RAA construct? Replacing passive equity with our focused value and momentum indexes definitely improves the historical returns and risk-adjusted ratios, but there is also a pickup in the drawdown by a few percent. On the net, the simulated benefits look promising, but there is still that pesky drawdown problem. #3 Risk Management: instead of no downside protection, use downside protection. As we saw above, diversification is a prudent thing to implement in a portfolio. However, if the goal of your investment program is to capture global risk premiums and minimize permanent loss of capital, diversification isn’t going to cut it when correlations go to 1. Even the RAA Simple portfolio, which diversifies across a broad swath of assets, ate a 40%+ drawdown in 2008. Yikes. If diversification isn’t going to help some investors achieve their goal of minimizing extreme tail risks, what can an investor do? Unfortunately, we enter a murky world of complexity, which should automatically raise our spidey sense. In fact, any effort to minimize tail risk almost necessarily requires that the portfolio be 1) diversified and 2) be dynamic. A 60/40 portfolio or a RAA Simple portfolio are both diversified, but their allocations aren’t dynamic. However, there are one class of models that are fairly simple and have historically achieved the goal of capturing risk premiums, while simultaneously minimizing the risk or large drawdowns. These models generally fall under the category of “trend-following,” and include things like moving averages and channel breakouts. The application of simple moving average rules has been demonstrated to protect investors from large market drawdowns, which is defined as the peak-to-trough decline experienced by an investor. For example, Jeremy Siegel, in his book, Stocks for the Long Run, explores the effect on performance on the Dow Jones Industrial Average from 1886 to 2006, when applying a 200-day moving average rule. Applying the rule is straightforward. If the market is above the 200-day moving average rule, hold, otherwise, go to cash. Siegel found that this simple technical rule outperforms a buy-and-hold approach, both in absolute terms and on a risk-adjusted basis. Meb also highlights similar results in his paper on the subject of long-term moving averages. We’ve conducted a similar analysis on the US stock market from 1801 to 2015 and found that trend-following rules applied on the generic stock market have been effective at minimizing tail risk events. We’ve extended the analysis to every asset class where we could get our hands on the numbers and investigated the results. Same conclusion: trend-following minimizes tail risk. Got it. This so-called trend-following aspect helps minimize large drawdowns, but 1) why should I care? and 2) can you explain the voodoo behind it? For some investors with multi-decade horizons, managing large drawdown risks, especially if it comes at an expense to long-term compounding, may not be a great idea. However, for some investors, who have shorter horizons and/or more immediate liquidity needs, risk-management is really important if they want to achieve their investment goals. The chart below highlights why large drawdowns are hazardous to your wealth. The chart on the left shows what happens to an investment portfolio when it is cut in half. Just to get back to even requires 11 years at a 7% return. Perhaps some people don’t need to tap that capital for 11 years so compounding out of the drawdown isn’t a big deal. But what if the plan was to live off your nest egg? Taking a 4% yield on $100 is one thing — taking a 4% yield on $50 is entirely different and may no longer meet the investor’s needs. The chart on the right shows what happens when there is a less severe drawdown of 15%. This is obviously not the ideal outcome, but if an investor seeks capital appreciation, they must take on risk, which means drawdowns and volatility are inevitable. But a 15% drawdown is much more manageable and only requires 3 years at 7% compounding to get back to even. A lot of investors can wait out 3 years of pain, but few can deal with 11 years of pain. Roger That — I Get Why I Want to Control My Drawdowns. Can You Explain the Voodoo Magic of Trend-Following? We have a time series, or absolute momentum rule, and we have a long-term moving average rule. This rule is meant to avoid assets with poor absolute performance. If Excess return >0, go long risky assets. Otherwise, go alternative assets (T-bills or Zero). Popularized by Gary Antonacci and rigorously examined by Moskowitz et al. This rule is meant to avoid assets with poor trending performance. If Current Price – Moving Average (N) > 0, go long risky assets. Otherwise, go alternative assets (T-bills or Zero). As the equations highlight, MOM and MA rules are tied together: Time-series momentum rules (MOM) are a function of MA rules. And while MOM and MA triggers are highly correlated, there are circumstances where the rules have a difference of opinion. What Does Trend-Following Do For the Model RAA Portfolio? Step 1 outlined the idea that we don’t need overly complex asset allocation frameworks to capture global risk premiums. Step 2 suggested that we can maximize our chance of the highest expected equity risk premium via focused value and momentum exposures. In step 3 we’ve suggested that trend-following can help minimize the chance of large drawdowns. Let’s see how trend-following affects the RAA system. RAA Moderate Index = 60% global value momentum and trend equity (GVMT_INDEX_NET), annually rebalanced; 10% passive real estate investment trusts (REIT); 10% passive global commodities (GSCI); 20% Intermediate-Term U.S. Treasury Bond (LTR). ROBUST Trend rules trigger index related trading for the hedge and components and are rebalanced monthly. 50% 12-month time series momentum rule and 50% 12-month simple moving average rule. For a given asset class, the rules are calculated based on the underlying passive index. i.e., S&P 500 Total Return Index is used for domestic equity; MSCI EAFE Total Return Index for international equity. RAA Index results are net of 75bps management fee. Here are the results comparing RAA Simple (passive IVY5 portfolio), RAA Val/Mom (RAA Simple with value and momentum equity exposures), and RAA Moderate Index, which is RAA Simple Val/Mom, but with the addition of our trend-following rules applied on each asset class. One of these systems doesn’t look like the other. The RAA Moderate Index, which includes the trend-following overlay has a more favorable drawdown profile relative to the other globally diversified portfolio. Sure sounds great if my goal it to capture global risk premiums while simultaneously looking to minimize the likelihood of eating a major loss along the way. What’s the catch? First, systems like the RAA index are not going to track standard benchmarks. The chart below maps out the 12-month rolling compound growth rate for the model portfolios in the table above and the US 60/40 portfolio (monthly rebalanced across S&P 500 and 10-Year bonds). One can expect to underperform (and outperform) the generic 60/40 in any given year or set of years. But that is to be expected because the US 60/40 is a different portfolio with different objectives than the RAA Moderate Index. The RAA Moderate Index is built to capture global risk premiums and minimize the chance of large tail risks. The US 60/40 portfolio is built to capture US risk premiums. Different portfolios will mechanically lead to different outcomes. Second, the RAA system can’t eliminate volatility and isn’t build to minimize short-run volatility. By construction, RAA will hold risky assets in order to try and capture some returns. Again, the golden rule of investing still applies here: no pain, no gain. So the RAA Index will go up and down and all around. No way around that reality if part of the investment goal is to grow the investment portfolio. RAA is our best effort to develop a simple model. Developing a complicated model would have been easier, but simple was a considerably more difficult challenge. We’ve discussed the three building blocks of the RAA Index methodology: simple asset allocation, evidence-based security selection, and a trend-following based downside protection mechanism. Here is a detailed visualization of the RAA Index process (moderate shown). We start with a more robust 60/40 framework that splits the traditional bond-only 40% diversifier bucket across real and bond assets. Next, we replace passive stock exposures with focused value and momentum exposures. Then, we calculate trend-following rules for each asset class to determine their respective exposures. Finally, we implement the model. Is the RAA Index process a holy grail? Is the RAA Index appropriate for all investors? Highly unlikely. Long story short, RAA will not always work and will often underperform standard benchmarks. But that is baked in the cake. The RAA Index mission is goal-oriented and seeks to provide capital appreciation with downside protection. The RAA Index is not meant to track the 60/40 index or closely track generic benchmarks. The RAA Index is not meant to outperform X, Y, or Z. The systems are simply our best attempt to achieve the goal of capturing global risk premiums, while simultaneously minimizing the chance of a permanent loss of capital. Simple as that. We want to emphasize that RAA is merely one solution we have proposed to achieve a specific investment goal. There are a set of other solutions in the marketplace that seek to do similar thing and we recommend that investors explore all of these options. However, we suggest that investors can narrow their solutions down to those options that are simple, liquid, transparent, affordable, and tax-efficient (if applicable). Sounds great — What’s the next step? DIY investor: we provide free tools to help investors facilitate a variety of tactical asset allocation strategies (to include the RAA Indexes). Managed Accounts: We seek to track the performance of our RAA Indexes via managed accounts, which are offered via our automated offering, Alpha Architect Advisor. Sub-Advisory: Are you advisor looking to achieve the RAA Index objectives? We can help facilitate. Ask Your Advisor: Are you currently a client of an advisor and you’d like them to explore our solution? Let us know — we’ll help them get up and running. As always, feel free to contact us if you have any questions and or thoughts. 1. ↑ Of course, as the authors of the book, DIY Financial Advisor, we’d be remiss if we failed to mention that another option for investors is to simply Do-It-Yourself. This is a fine option if one has the 1) time, 2) sophistication, and 3) discipline to identify an investment goal, build a portfolio to achieve that goal, and can stick to the program through thick and thin. 2. ↑ I have a Google Talk on the book if you want a video version of the DIY philosophy. If this is too much brain damage, simply head over to our active robo advisor and we’ll implement a strategy that attempts to follow the RAA Index most suitable for your investment profile. 3. ↑ Past performance is no guarantee of future results. Any historical returns, expected returns, or probability projections may not reflect actual future performance. All securities involve risk and may result in loss. Our downside protection models may not work in all situations and could fail to achieve their objectives. Source: DeMiguel, V., L. Garlappi, and R. Uppal, 2009, Optimal Versus Naïve Diversification: How Inefficient is the 1/N Portfolio Strategy? Review of Financial Studies 5, 1915-1953. The results are hypothetical results and are NOT an indicator of future results and do NOT represent returns that any investor actually attained. Indexes are unmanaged, do not reflect management or trading fees, and one cannot invest directly in an index. Additional information regarding the construction of these results is available upon request. The chart above is visualized below. Sharpe ratio is on the X-axis for the various asset allocation systems trading with S&P sectors. Note that the simple 1/N strategy works as well, and often better, than more complex approaches. 5. ↑ Why this portfolio structure became the benchmark solution is beyond me and perhaps there is someone who has done the history of how this came to be. All indexes are gross of fees and reflect total returns, including dividends and distributions. 7. ↑ The most compelling argument is with respect to the commodity exposure, which we benchmark using the GSCI index, however, there are economic and evidence-based reasons why in practical implementation GSCI may not be the desired vehicle. 10. ↑ Here we present simulated gross of fee performances of these two strategies from 1/1/1963 to 12/31/2015, using publicly available data from Ken French’s website. MOM_10 = Top Decile Momentum (Data); Momentum has worked! VAL_10 = Top Decile Value (Data); Value has also worked! 12. ↑ We have examined hundreds of risk-management platforms over the years. You name it–we’ve backtested it, thought about it, and/or considered implementing it. We’ll keep testing new ideas and trying to identify the holy grail, but we haven’t found it yet. Conclusion: Asset allocation models are 99% noise; 1% signal. The sad conclusion is that none of these ideas stand up to intense robustness tests, except for the simplest, technical rules. You just can’t beat them. 14. ↑ Here is an extensive study on these rules and their historical performance on a slew of generic return data series.